In case when your laptop freezes because of lack of memory, you need to upgrade RAM. Sometimes you can just add some more RAM cards to free slot, and sometimes you need to replace RAM card, when there is no free slots for new. But in any case you need RAM card same type that is installed to you laptop: it's always SO-DIMM (laptop type of memory) and other characteristics depends on your laptop and RAM installed in it. 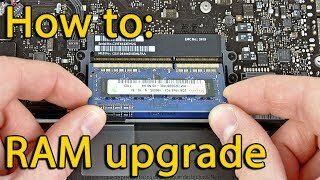 In any case, I will place links to most likely RAM cards that must fit to your laptop in description and in 1st comment of this video. This video intended for general information only. We will not accept any liability for damage or injury caused while following this guide. Any reliance you place on such information is therefore strictly at your own risk. This video description and commentaries contains affiliate links, which means that if you click on one of the product links, I could receive a small commission.